Excellent question and what a coincidence as I was thinking the same exact thing yesterday after pulling into the slip and flushing the engine. And I have the same engine. I'm changing a few OEM pulleys to ss ones because the original ones are starting to rust and the black paint is peeling and flaking all over the place and never thought of asking the VP dealer about the manifolds and especially risers. Very curious to find out. Money is no object ? No Money matters but Stainless Marine makes a set and I know a lot of performance boaters use them I think they are actually have an aluminum jacket. from the website. Hard to tell though if the $3,300 is X2 or for the entire kit. If it is the entire kit, that might be a consideration. I guess the best way to figure out is total cost for each and life span of each. If they want 6 grand for a set, Id opt to replace the iron ones 3-4 times first. Why would anybody use 2 different metals in a very hot SALT water system. The corrosion risk & expansion rates are not good. Corrosion of Aluminum in hot salt water is not a good idea. All stainless with WELDED joints is the correct way. S S & Aluminum ?? You better not ever fire up DRY & rev it a few times. So are you doing them this year? Have you decided anything further on the SS ones? Do yours look anything like mine? Currently at the VP distributer getting all my goodies for winterizing and the manager is such an awesome dude really helps me out all the time I'm in here, spends a ton of time looking for the right parts and numbers etc. and I was looking to get the stock risers and manifolds quoted and the original parts numbers from 2010 were discontinued, but for the replacements I need to find out if it's the 3" or the 6". Either way, worst case scenario for the pair of risers, manifolds AND Y-pipe came out to $2,360. Anyone with experience in these 8.1 VPs know if that's basically the average price for all that? That way we can compare if the difference in upgrading to stainless steel would be worth it. If your going to keep your boat, say for the next 10 years+. Wellll maybe?? Myself, I have had my boat for the past 6 years. I expect to get another 2 to 3 years out of the manifolds and risers. I HOPE that in the next 1 to 2 years to sell this boat, for a 32 or 34 footer. So to spend that kind of money, one must really think about. When am I buying my next boat?? Rather than using stock manifold. Just keep this in mind. Almost all Volvo 8.1 have extended risers. Make sure you keep them or replace them or you will have hydro lock issues. I need to find out if it's the 3" or the 6"
Hatem, with your picture, you have the 6-inch variety. To confirm, the elbow is about 7.5 inches tall (from the top of the casting to the underside of the machined flange). The standard version doesn't use a riser, but the elbow is the same (as used with the 6-inch). The 3-inch uses a different elbow; single piece elbow/riser. Yeah I figured it was the 6". Thanks, Curt. To me it's not a question of whether I'm keeping the boat for another 10 years or how long I'm keeping it. They're on their way out and starting to leak (almost 400 hours on these now) as can be seen in the pics so they need to be changed at some point soon, no matter what. Not going through another season with these ones as I'm bound to face issues and not the type to wait until a problem develops when its symptoms are slapping you right in the face. Question is whether it's worth spending the extra gino for the SS ones. Although Clopadopadus brings up a good point about the aluminum jackets. Need to research that a bit more before deciding. If indeed the aluminum jackets are fine, I think spending the extra $1,000 is well worth it. His point about dissimilar metals is good and accurate. I’d stay with the OEM. You know what the performance has been, and therefore will be. Actual life is unknown on the stainless/aluminum option. Could be better, could be worse. Won’t know until some point in the future, and before then you might catch 2 to 3-foot (or more) itis. As a possible alternative Chevy water cooled headers. Many older Jersey Skiff racing boats have solid polished Aluminum header. I still have many contacts in that engine class if you are interested. A side note about the Aluminum headers. They NEVER turn colors when run WOT for long high temperature periods. S S can & does easily if overheated They also warp & cause difficult to correct exhaust manifold to cylinder head leaks..
Do search out marine Aluminum Chevrolet exhaust headers. Big & small block.. Did / does G M offer Aluminum headers on the racing engines ? Good news................ www.cpperformance.com still is around. Hi-Torque Big Block Exhaust Manifolds System feature state of the art design with single wall internal casting that is enclosed in a press formed aluminum jacket creating a fully water cooled manifold. A highly polished stainless steel risers comes standard as well as bolts, gaskets and fittings. This system is also covered with an exclusive 5 year limited warranty. The aluminum is the jacketed manifolds, but the risers are all SS. Besides, isn't aluminum much better than the cast iron anyway? Not only does aluminum heat up a lot less, it doesn't corrode or rust anywhere near the way iron does, not even close, right? And if it's only the jackets of the manifolds, that's actually a good thing I would think since that's essentially the outside, black casing of the manifolds. Aluminum heats up the same, just gets there and dissipates faster. It’s vastly more thermally and electrically conductive. Cast iron, though, holds heat longer (a heat sink). Aluminum is a reactive metal. It corrodes, more so in salt water, and especially when dissimilar metals are involved (whether yours or what’s nearby). The corrosion takes the form of a white skin (which, when significant, complete and quickly developed, is actually a barrier to further corrosion) often with a bit of a powdery appearance and feel. You’ll need to watch the anodes, and may need to change the type. In addition, given you’re splashed at a marina, in salt, neighboring slips, boats, types of metals, shorepower and electrical leakage all become more relevant and part of the success (or failure) equation. Aluminum is more reactive than iron, steel, bronze, etc. It’s all been considered by the manufacturer, thus the 5 year warranty vs. lifetime (where common knowledge and thought would suggest aluminum and stainless should be lifetime). Your call. P.S. What’s depicted by the picture looks normal. Assuming no leaks, if they flush clean and there’s no solid debris, replacement is premature and another season to three is expected. Also, current generation VP’s are all aluminum, including exhaust manifolds, risers, etc. Lighter but also eliminates the dissimilar metals problem. I know its a expensive upgrade over the Volvo brand if I go with Stainless, I am average about 5-6 years on the cast iron so other then the slight performance gain, I don't think the stainless will be worth the extra price. Also like all 256 I have 11" riser on mine to avoid water back up the tubes. I already over spent my budget this year when I had to pull the motor to replace the starter and of coarse all the extras while it was out. Not from Hardin Marine but essentially the same manufacturer and product. 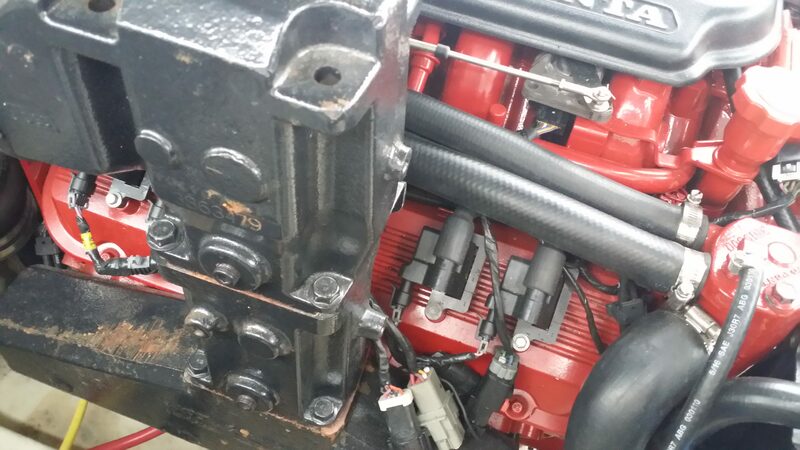 Great read on the installation of these SS manifolds and risers on a VP 8.1. Doesn't seem to be any indication of any problem with the manifold casting being encased in an aluminum jacket or any issues with dissimilar materials. That's an excellent link, Clops. Thanks for posting that. Some great information on the design of the Hardin Marine Seaward series of stainless steel manifold and risers they offer and it's $600 less than the Stainless Marine ones. Too bad it seems to only be for Merc big blocks, but will have to check further. But the Seaward series for salt water use sounds phenomenal. AND is also aluminum & stainless combined but the way they design the internal passages of the manifolds with separate, individual runners for the headers instead of the way the other manufacturers (including OEMs) do it which combine all headers on each side into a single chamber. Although I would check with Stainless Marine to see if they do in fact do that or not, just for knowledge sake but either way, this seems like a much better choice. Plus they use 356T aluminum and 316L stainless steel. You also get better cooling and a slight increase in HP but they do say it is slightly louder "when the boat is out of the water" and a "deeper bass rumble under water" lol. I actually prefer it to be quieter TBH. The days of loud exhaust are kinda over as the days of getting older go by. Actually I was wrong. I thought they were the same like I mentioned before but they're not. The pic above was Stainless Marine, but Hardin makes their own. 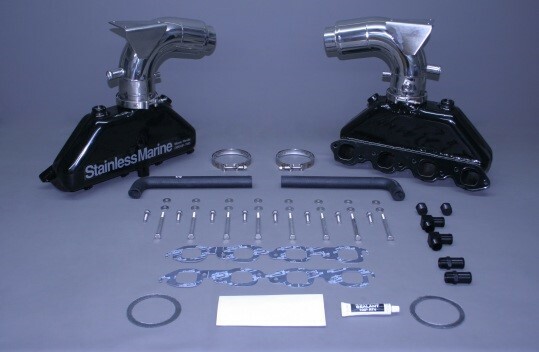 I can see why you thought it was a quality piece of kit as I'm reading more about this Hardin SS Seaward exhaust manifold & risers, and they're about $600 cheaper for better quality, design and material. I know what you mean and thanks for that information. I've seen plenty of corrosion on aluminum and even have some on my outdrive (which BTW was on there when I bought it and it only had 40 hours of fresh water use). I've since fixed those few spots and they've been fine, but either way, I don't think you'll get a lifetime warranty on anything of this sorts. Even the VP cast iron ones are only offered with a 1 year warranty and the Hardin SS ones come with a 3-year warranty. But I understand your point, that you would think with these materials and cost, the warranty would be available to represent the product's longevity. But I don't think it's due to the use of aluminum & ss that's influencing it in this case, but more so the proper or improper installation and other extenuating circumstances that are beyond what the manufacturer can guarantee. And the fact that heat dissipates better in aluminum vs cast iron is only a plus, anyway. I'm going to find out more from them about the use of dual metals since it's hard to believe that they didn't consider such an obvious point. Those are leaking, Curt. Rusty water coming out of the riser joints/gasket and dripping down into the bilge. They're also 8 years old. I haven't noticed any change in engine temperature except those couple of days it was really hot and humid, but it was only a couple of degrees hotter than normal (164) but that's it. Still, they shouldn't be leaking at all and that will only get worst with more use. You wouldn't leave those like that for another season let alone 2 or 3 more in that 307, would you? Recall, none of us have knowledge of quantity leaking or visual of your bilge. Only you do. Based on the posted pictures, and considering age, it’s great and I don’t get all hubbub regarding stainless. (Also, not poking you here, but a header and manifold are different. A header is generally used with a different objective in mind.). Yes, if at that age and that minor, I’d go another season and reassess. I’d also replace with cast Volvo Penta. FWIW, the small leakage looks more like uneven torque, or a little heat induced warpage. Don’t attempt to retorque now. It will get worse. Congrats on Red Sox. Recall, none of us have knowledge of quantity leaking or visual of your bilge. Only you do. Based on the posted pictures, and considering age, it’s great and I don’t get all hubbub regarding stainless. I had no idea you responded until I just happened to check this thread and saw your reply. Unless you actually quote the individual you're replying to, it doesn't notify him/her so they might miss it. Yeah they're leaking. I would think that risers in good condition would not show any rust around the joints and especially dripping down onto the manifold, as in that pic. Sorry it seemed obvious to me, my bad. lol. So I had to go back and read all that crap I wrote to see what the heck you were referring to by "headers" and I see the brain fart I had lol. Yes, obviously the manifolds sit on the exhaust valves and not the headers duh. I had headers on my mind because that's what impressed me in those Hardin Marine manifolds, that they have individual, tubular headers instead of a single, combined chamber that sits on all 4 exhaust valves, unlike the OEMs and even the Stainless Marine manifolds. But something tells me you knew what I was trying to say anyway. That's ok, you can poke fun all you want, Curtzation. Coming from you it's totally cool ma man. Yes, if at that age and that minor, I’d go another season and reassess. I’d also replace with cast Volvo Penta. FWIW, the small leakage looks more like uneven torque, or a little heat induced warpage. Don’t attempt to retorque now. It will get worse. Congrats on Red Sox. Interesting. Uneven torque would cause both of them to show those signs of rusty joints? They both have the same amount of that rusty leaking and I must say, they get pretty warm but I can touch them and keep my hand on them, so they don't heat up enough to be too hot to the touch. I just don't like the leaking and to me, that's a bad sign of corroded water jackets (even possibly the exhaust channel) or at least failing gaskets. I think I will be at least taking them off to inspect them. My guess is they're either badly corroded or on their way but definitely that gaskets are shot. Otherwise there wouldn't be any rusty leaking around the joints like that. So while we're at it, what are the signs of bad risers to you? What would it take for you to say "ok, those are no good time to change them"? Much higher temperatures? Exhaust sensor going off? More rusty leaking? GREAT tutorial on changing Volvo Penta exhaust manifolds and risers. It's for a 5.7 but the overall procedure is almost identical for the 8.1, you just have the extended riser but other than that, same exact thing. The riser bolts are different in that they are the longer ones but other than that, same procedure and this guy does a great job showing the steps.